In director Amit Masurkar’s second feature, we land into the ever so old tussle between idealism and reality. Set in the backdrop of the world’s largest democratic election in India, with an extremely volatile political air, we see our protagonist Newton Kumar (Rajkummar Rao) trying to make sense of the senselessness, find peace in the chaos, resisting the oppression, and eventually submitting to it. Or did he? I don’t remember having met a person like Newton, the idealist who believes in doing things by the book, no matter what the circumstances be. In fact, Newton is an abberation in the times we live in. Newton is honest, to the point of being proud about it and showing it off, as his senior states. Masurkar’s second feature couldn’t have been more different to his urban comedy debut (Sulemaani Keeda) about struggling filmmakers in the land of Bollywood. With Newton, Masurkar doesn’t limit his narrative to telling the obvious right from the obvious wrong. We see the world of Newton in the span of the very few days leading to election day. And then as he experiences through the people he meets – the army officer (Pankaj Tripathi), the tribal subordinate female chief (Anjali Patil), his associate clerk (Raghubir Yadav) and juniors, the junior Army officer, his own parents, and the burnt world of the tribals. Newton is embodied by Rao in a performance that doesn’t have dramatic lines to express, but you can smell the frustration of the straitjacketed administration that handicaps what would seem like his obvious dutiful behaviour. There is a particular scene in Newton which beautifully captures the theme of Newton to me. When Newton is lessoned about the harsh reality of how insignificant an election is to the daily lives of the tribals in the village by his junior clerk, an aspiring writer who has submitted to the routine of a cozy government job, he asks Malko – are you also as Niraashavaadi (pessimistic) as them? She simply replies – No, I am Aadivaasi (tribal). Newton maybe idealistic and wants to carry out his duty, but he is also ignorant of the bigger picture. His willingness to go through any means to achieve his duty goal is short sighted. There is hardly anyone of the 76 tribal people eligible to vote who has a clue of the elections – the candidates representing them, or what they promise to be on their agenda. People are busy making ends meet, worrying about basic necessities of life. And when they are not doing that, they are worried about their homes not being burned down by either the army, or the Naxals. Where does the round idea of democracy fit in this irregularly shaped hole? As Newton fast descends into a more insane and far fetched tale, we do not lose the sense of realism however. And it is Rajkummar Rao’s grounded performance that makes it so. Now here is a movie that is not simply about an obnoxious idealist that you might not completely agree or identify with. It is also a tale of the far from perfect world we live in – a world fragmented by political interests and corruption, where Newton is not an ideal employee, but almost an absurd lunatic. He is one who needs to be kept silenced and consoled by trophies of punctuation awards. The movie however is not mean spirited about any of its characters. Masurkar narrates the film in a tone balanced between drama and suspense, often juggling it with absolute ease, and there are some humorous moments as well. But the laughs often come at the cost of how harsh the truth is. 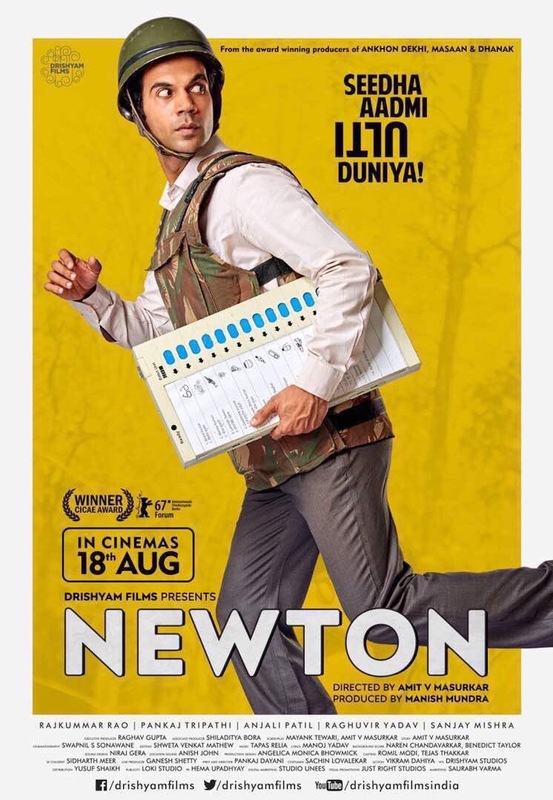 An award-winner at the Berlin International Film Festival in 2017, this delightful black comedy stars one of India’s top young character actors, Rajkummar Rao, as Newton, an everyday clerk who is selected for election duty in the conflict-ridden Indian state of Chhattisgarh. As local police and Maoists harass the locals and the voting process spirals out of control, the morally driven Newton becomes a reluctant hero in his zest to save the day.